Hacker Evolution Duality is exosyphen studio’s latest hacking sim. The game has seen a major redesign compared to the previous two titles in the series including a new graphical UI based gameplay and a variety of mini-games replacing hacking commands. Hacker Evolution Duality begins in 1999 during the height of the Y2K frenzy. For those too young to remember, computers used to be programmed with the last two digits in the year. The fear was that when the year 2000 struck, computers would not know what to do with themselves and all sorts of terrible chaos would result. Hacker Brian Spencer is in the thick of the frenzy with an innovative solution to the problem. Unfortunately, a rival company has decided to steal Brian’s hard work. Being young and impulsive, he decides the best solution is to forcibly liberate his files. After all, Brian has a big business deal in the works and a lot of money is on the line. This is the first toppled domino in a chain of events resulting in Brian’s downfall and eventual recovery. The plot is actually extremely scant in Hacker Evolution Duality. The story is completely limited to the short introductions provided at the beginning of each level. Considering the campaign portion of the game contains only six story missions, the plot is anemic at best. 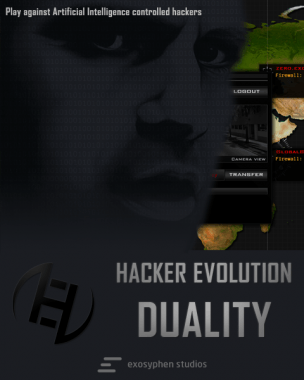 Hacker Evolution Duality updates the game to modern operating system design. Long gone is the console, traded in for a sleeker graphical user interface. Due to this change, Duality feels even less like a hacking sim and more like a strategic puzzle game with a hacking theme. For the exception of penetrating firewalls, breaking the server security now requires players to successfully complete a short mini game. They range from the extremely simple click the mouse button when two arrows aligned to the blisteringly difficult Key Crack game. Also new to the series is the addition of AI controlled hackers. Hacking certain servers will alert the wrath of the server admin and will result in painful counter attacks at a constant interval. Players will have access to more money this time around allowing for freer spending habits. They still must balance CPU upgrades with reinforcements to the firewall and integrity score. Enemy AI will turn some of same tools you use against you, like the devastating EMP attack, to chip away at your firewall and your computer’s integrity. Although the global Trace score is still an important objective in several levels, ensuring your computer’s integrity score doesn’t drop to zero becomes priority one, closely followed by maintaining a firewall. Just as you can be destroyed, so can enemy servers. 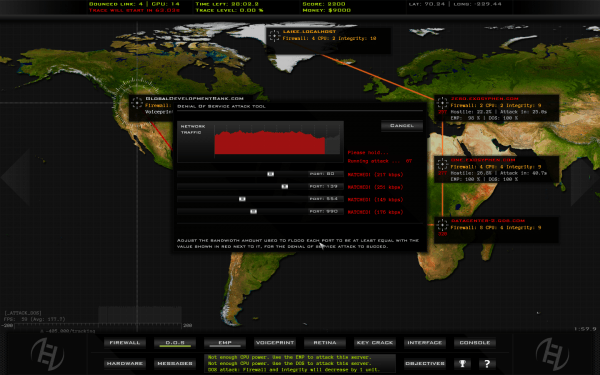 Since hacked servers play an important role in hacking harder targets and buying the player extra time to hack, the decision to destroy enemy hackers becomes an important part of the game’s strategy. exosyphen studios attempted to address one of the biggest problems with previous titles by making each level independent of the others. In previous games, the Trace score, money, and upgrades were carried on to the next level. In Duality, the player starts each level fresh with a default amount of money and upgrades. Additionally, older levels can be replayed without having to start the game from the beginning. Three levels of difficulty have been added to the game to further address the previous games’ difficulty level. 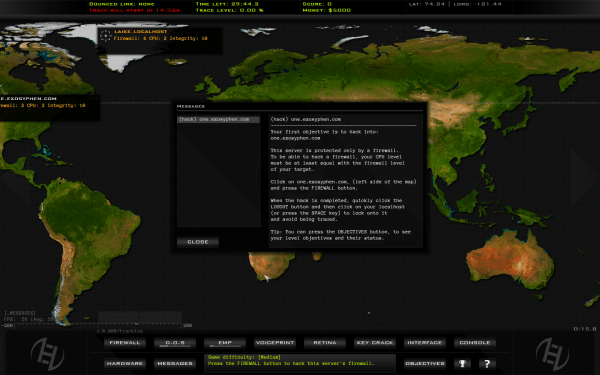 Many of the changes made to address criticism from previous games were effective, but a completely new problem was introduced to Hacker Evolution Duality in the form of the dreaded Key Crack mini-game needed to decrypt servers. Even at easy difficulties, Hacker Evolution Duality is hard. The early levels can be completed with a bit of good strategy. They are tense, a little frustrating, but enjoyable. However, unless you can conquer the Key Crack mini game effectively, the game quickly becomes a painful exercise. The Key Crack mini-game sounds easy enough when it is explained in the guide. Click randomly ordered numbers from 63 to zero before you are traced. In reality, not only are you racing against the clock, enemy AI hackers are brutally depleting your defenses and the font used for the numbers tend to make the numbers look the same. Most of the time, there simply isn’t enough time to complete the mini-game. On certain portions of the game, even if you dump all your money into firewall points to buy yourself time to complete the mini-game, a slower player will find the Key Crack mini-game impossible. On the other hand, I found the open world levels to be more fun than the campaign. Although they are still very difficult, some of the pressure from the AI hackers is diverted as hackers go into a free for all deathmatch to be the last man standing. The action is more frantic, focusing less on the puzzles and more on the mini-games and electronic carnage. 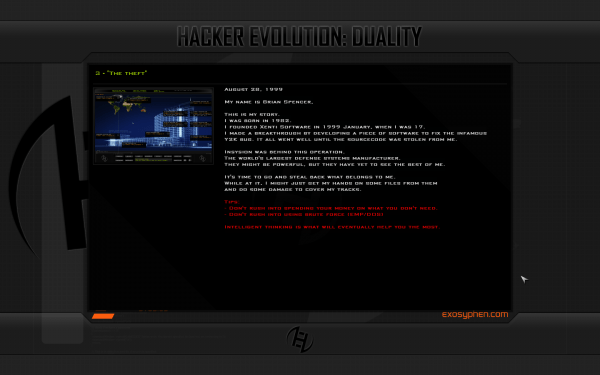 Hacker Evolution Duality is an excellent looking game. The UI design is simple, clean, and usable. I only wish it was possible to move windows around for a better view of the map. Although there are no fancy 3d animations in Hacker Evolution Duality, the graphics are sharp, well designed, and thoroughly enjoyable. Hacker Evolution Duality is the first game in the series to venture away from the pounding electronica genre and fuses it with traditional video game orchestral scores. Although the game still doesn’t match the audio to the pacing of the game, the music comfortably swings back and forth from the intense electronica to more eerie and haunting orchestra pieces. Hacker Evolution Duality was a fantastic move in the right direction for the series. Unfortunately, the difficulty level of the game is an extreme stumbling block. exosyphen studios made a gamble by radically changing the gameplay compared to the previous two titles. I strongly believe if the difficulty level of the game is addressed, Duality has what it takes to be an indie cult classic.